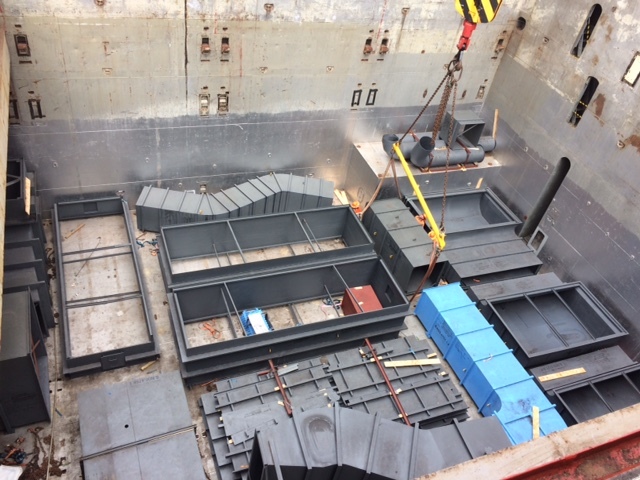 NSS Cairns operations have clocked up four major project cargo shipments in recent months. They included the final shipment of wind turbine equipment for Ratch Australia's Mt Emerald Wind Farm, under construction on the Atherton Tableland. This included 12 tower sections, 26 hubs, 26 Nacelles and 11 x 40ft containers. It followed another delivery in February of 48 tower sections for the project. NSS Cairns also helped unload 63 break bulk packages for transportation to MSF Sugar's $75 million green power plant, being built at their Tablelands Mill. In January, NSS was assigned to lift and shift a new 58-tonne reef vessel arriving in Cairns aboard the heavy-lift ship BBC Alberta. The Calypso XII was 24.4m long, 9m wide and 7.2 m high. (Image below - ducting for the MSF project).